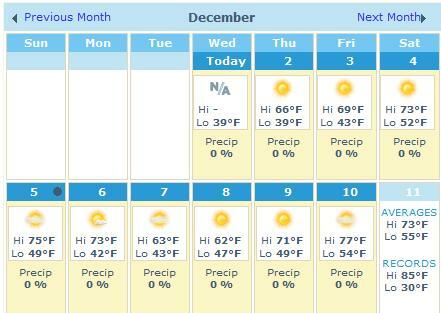 The Good Stuff: Welcome, December! I just needed to give an official welcome to December! Look at that weather forecast! I think we can finally wave goodbye to sweat-inducing afternoons and evenings and finally look forward to sweater weather. I don’t think it can get any better than that. No rain in the forecast, and highs in the comfortable 70s! I can live with lows of 40 for a few days… as long as the afternoons are crisp and beautiful! But alas, December has only become so special for me only as recent as last year, when I started falling for the most incredible person in the world, my best friend and future wife. So of course, we’ll always have our special time in December when we fell in love and she came to surprise me, and our first date! So as 2010 winds down, we’ll keep the writing momentum going here at The Heap. We’ll keep the tweeting, and we’ll keep living life and enjoying every little aspect. So much has changed in these past two years. Yes, everyone’s favorite dormant blog is BACK (at least for the time being). Two years ago today I started my little project. A project with which I have become slightly disappointed with… mostly since I felt that The Heap was an extension of Me. And well, lately… as you can see… there hasn’t been a post in about three months. I just haven’t felt like writing. But it wasn’t until recently that I missed what this quaint, rather insignificant cyber stage allows me to do. I’ve thought of so many ideas, so many things I’ve wanted to write about. There are so many things happening in our world. So many great (and not so great) pieces of work to consider. The Rays and Yankees are beginning the last two months of what seems to be an epic race to the top of the division and ell, MLB standings. Steve Yzerman has made stellar moves for the Lightning as the new GM in the off season. And the Bucs… well, they’re the Bucs. I’ve become distant from here, I’ve become distant from myself, I’ve become distant from others. I’ve become lazy. My room is a mess. I’ve gain a few pounds from just not caring. It changes today. I can’t just charge through weeks anymore, because I’m missing most of the ride. Taking things for granted. So once again, here’s to a new commitment to writing and to growing through it. Here’s to a new commitment to myself to improve. And most importantly: Here’s to The Heap, which I started two years ago as a “new start” in the midst of post graduation unemployment a new part of my life. Happy 2 Year anniversary, heapsters, as we start anew again. After a few months of waiting, one of my FAVORITE bands of all time is in town! St. Louis’ own Story of the Year makes a stop here in the Tampa Bay area, and you better believe I will be there. So of course, I will be stream a segment of the concert live on the blog. You can expect footage from 9-10 pm… anywhere in between. It’s been a long time since I have seen these guys live. There were at Warped Tour a few years back, but I wasn’t able to make it that year. Though I did see them at Warped waaaaay back in the day circa 2004/2005, where they absolutely ROCKED it. They know how to put on a performance, I am am excited to see them at the State theatre in St. Pete, a smaller venue. They’ve also recorded two albums since I’ve last seen them as well. In The Wake of Determination was just coming out when I last saw them, so I’ll get to hear songs from The Black Swan and The Constant performed. And of course, along with the random live streams, you can expect a nice reflection later this weekend, as well as finally, a review of their newest album!